The full source for the code used in this post is available on Github. I’m developing this with Visual Studio 2015 (VS 2012 should be OK), targeting .NET Framework 4.5, and I’m using Powershell v5 (although Powershell v3 or higher should be fine). Automatically sign all assemblies that could be referenced by our provider. All assemblies must be signed so that they can be installed into the GAC on the ADFS server. If this is not done, our provider will not be able to locate the referenced assemblies. The assembly signing process should occur on every build of our provider. Allow for a developer to deploy the provider to the ADFS server with zero manual steps. This is very important!. As far as I know, there is no way to remotely debug a custom provider. So, for us developers of these providers, we must make our code changes locally, deploy them to our test ADFS server, and then observe (not debug, just observe) our changes. This is an incredible annoyance and is also a serious detriment to productivity. As a result, I really want the developer to be able to rapidly deploy and enable the custom provider to speed up their dev time and to stay sane. I will detail the various steps that I think make up a full deploy a bit further on in this post. What Constitutes a Full Provider Deployment? The following are described as if they are happening on the ADFS server. Ensure relevant ADFS windows services are up and running. After a full deployment, the developer should merely have to refresh the browser in which they are testing their website in order to be exposed to their latest changes to the provider. I’ve added a NuGet package to the project to get a 3rd party assembly reference, specifically the Twilio package because sending SMS messages during the custom authentication processes could occur. Adding the Twilio NuGet package to the provider project will install two assemblies, Twilio.Api.dll and RestSharp.dll - but they are not signed assemblies! Because our provider’s assembly is signed, it can only use/reference other signed assemblies. To get around this, we can disassemble the 3rd party assemblies, sign them, and recompile them (see: Signing an Unsigned Assembly). This can be accomplished a number of different ways, but I think that a Post-Build event in the provider project is an ideal method. This assures that all assemblies will be signed when a developer does a build from within Visual Studio or if a sys admin does a full deploy and MSBuild is manually used to build the provider project. for /f %%F in ('dir /b /a-d ^| findstr /vile ".dll .Resources.resources .config"') do del "%%F"
Building the project will now get our assembly signing job done. However, this approach has the downside of not being generic. If a developer adds another NuGet package or assembly reference, they would have to update the postbuild.bat file accordingly. That’s not cool. We can convert this postbuild action to Powershell and make it better. The Powershell scripts for the deployment make use of Powershell Remoting, so make sure that is set up beforehand. I’m not going to post all of the scripts’ contents here (somewhat lengthy), but please [feel free to look over them on Github][https://github.com/ryanwischkaemper/adfs-mfa-provider/tree/master/DemoAuthenticationProvider/Scripts/ADFSProviderPublisher]. They cover and satisfy the goals that I laid out earlier, as well as the various steps that constitute a full deployment. Of course, there is always room for improvement, and I eagerly welcome feedback. Also, the scripts only target a single server, but they could fairly easily be adapted to target multiple servers. Using these scripts, a developer can quickly configure a target ADFS server (and several other related config params) in the Publish-AuthProvider.ps1 file and then execute that same file to quickly and entirely deploy their provider! Hope this helps out with your workflows when developing these things. Now run gulp run, and our nw app will start up for us. The project thus far can be found here. Now install Aurelia via jspm. To do this, we’ll copy this section into our package.json (it’s from the Aurelia starter app) and run jspm install -y. Add a simple Aurelia viewmodel and view. then we can run gulp run and see Aurelia running with NW.js. The project thus far can be found on here on Github. So far, we have only accomplished the minimum amount of setup to get Aurlia running within nw. In the next post, we’ll set up (and automate via gulp) styles, versioning, tests, production ready builds, and file watching for more rapid development. Modern client side development usually involves working with a large number of open source libraries. jQuery, Angular, Knockout, Meteor, and Backbone are some of the most popular, but more than likely you’ll also want to use a variety of others as well. When pulling these libraries into your project, it’s extremely important to do it in an organized, structured way. If you were to pull a 3rd party C# library into your project, you’d use NuGet because it manages what versions of the library you are going to use and it has a large selection to choose from. While NuGet is great for C# libraries, it is lacking in it’s choice of client side libraries. There is a large web development ecosystem that encompasses more than just the .Net world, and one of the most popular client side package managers used in that ecosystem is Bower. Bower does necessitate having NodeJS installed, so if you haven’t done that yet head over to their download page and run the installer. This post won’t go into detail on how to use bower or node - there are a large amount of tutorials already on the web. Using Bower, your client side dependencies will be managed much the same as your C# libraries are managed via NuGet. 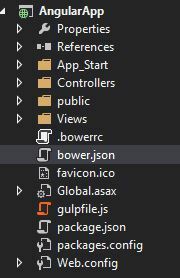 "description": "A basic AngularJS app"
At this point, you could use the ASP.Net bundling system to bring your Bower libraries into your Razor pages. An alternative is to automatically include your Bower libraries via an automated task runner such as Gulp or Grunt.